Summertime means hotter weather, vacation getaways and unfortunately for many of us, oily skin and pimples. Summer is also a carefree time when you might want to wear less makeup, so you don't want to worry about concealing those annoying breakouts. 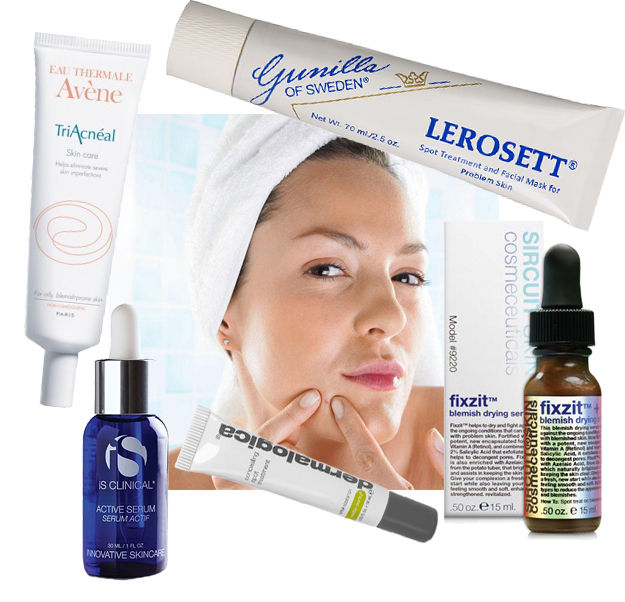 With our wide selection of the best acne products, we wanted to break down the 5 top rated spot treatments for you. Avene TriAcneal fights breakouts, redness and residual scarring by deeply exfoliating skin and promoting cell renewal. One reviewer even noted that "in the summer when my skin gets more oily and I have more breakouts this works wonders!" With Glycolic Acid and Retinaldehyde, it's a multi-tasker at keeping skin wrinkle free too. Treat all aspects of blemish prone skin with the organic Sircuit Skin Fixzit+. Reviewers state that this serum offers "immediate repair of blemished skin" and is "the best way to kill a zit." Another natural powerhouse, Lerosett Acne Clay Treatment, can be used as a spot treatment or mask. As one of the most reviewed products on our site, this clay normalizes oil and fights all types of acne - whether it be the occasional pimple or deep cystic acne. Clients also love it for treating ingrown hairs, acne scars, pregnancy related acne, large pores and oily skin. The amazing multi-tasking iS Clinical Active Serum has been a favorite among clients, celebrities, and the beautystoredepot staff for many years. Users state that it effectively decreases the frequency, size, redness, and healing time of blemishes while also improving overall skin tone and texture. Treat and conceal breakouts during the day with Dermalogica mediBac Concealing Spot Treatment. It also helps normalize excess oil production associated with the hot summer months. Clients love that this product gets rid of blemishes before they reach the surface and it doesn't dry out skin. For additional product recommendations, feel free to ask us in the comments or contact our beauty experts. These was quite the list of acne spot treatment and trying these all out might not be the best solution. Ask a licensed dermatologist regarding your condition or visit this acne scar treatment clinic in the Philippines and have clearer skin for yourself enjoy.